It has been a little lost among the excitement for all the other big RPGs out over the next month or so - Mass Effect: Andromeda, Horizon: Zero Dawn and NieR: Automata among them, but Torment: Tides of Numenera is a game that deserves a lot of attention. Why? Because it's the spiritual successor to one of the greatest narrative-focused games ever made, in Planescape: Torment. 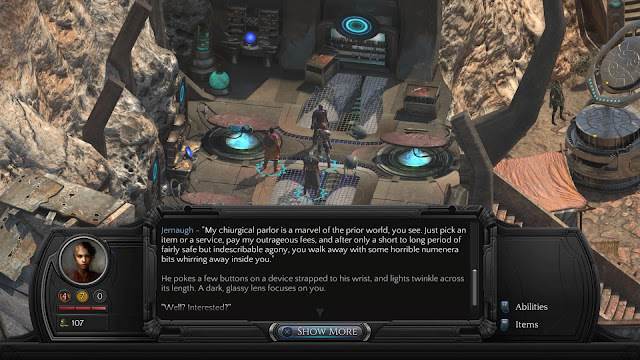 Overwhelmingly successful on Kickstarter back when it ran (raising almost $4.2 million when it was initially looking for just under $1 million), Torment was promising to take the baton from one of the few RPGs out there that people remember decades later explicitly for its narrative. What was perhaps most fascinating of all about the game was that combat was almost completely unnecessary; you could talk, trick, and cajole your way past most combat encounters, meaning that when combat actually happened, it had impact. In this day and age, with games becoming ever more action and combat focused, games that give you a genuine ability to avoid hostilities entirely are rate. And yet, that is precisely what Tides of Numenera is promising to do, beyond offering a very deep and complex narrative. I had the opportunity to sit down with a couple of the inXile team: Brian Fargo (CEO) and Adam Heine (Design Lead) to discuss what they were looking to achieve in the game and what players can expect, now that it has released on PC and consoles. Matt Sainsbury (MS): Why did you decide to take on a "sequel" to one of the most revered RPGs ever created? Brian Fargo (BF): Because people really, really wanted it. “When are you going to do a new Torment?” was up there with one of the most frequent questions I’d hear in the last decades since the original. When we took it to crowdfunding, people proved their interest in a new Torment was real, making it one of the most successful crowdfunded games. MS: What was it about Planescape: Torment that you felt to be most important, and how have you gone about changing/ updating/ paying homage to those features? Adam Heine (AH): That was the first question we asked ourselves when prepping for the initial Kickstarter campaign, and we drew all our major design pillars from that discussion. Like Planescape: Torment, Torment: Tides of Numenera is set on a world unlike any other – in our case earth a billion years in the future, a world that matches Planescape in its opportunities for the weird and bizarre. And again, we wanted to tell a deep, personal story – not an epic story about saving the world, but a story about you. And much like all inXile games as well as Planescape: Torment, we have a focus on reactivity, meaning we offer the player real choices with real consequences to those choices. 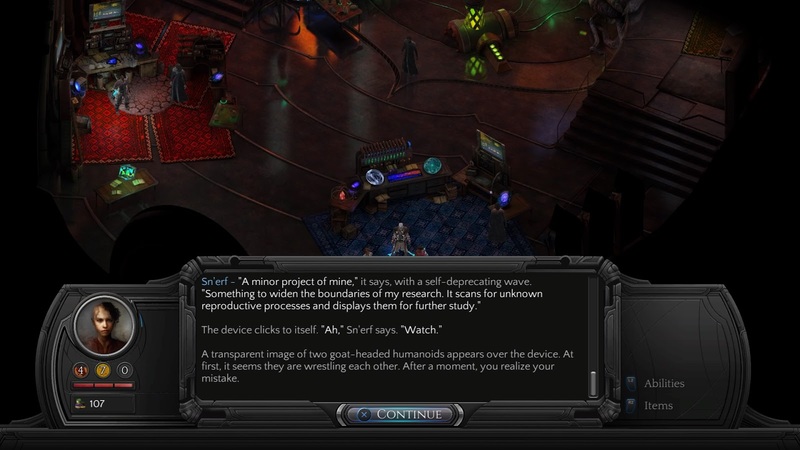 Torment: Tides of Numenera should feel very familiar to fans of Planescape: Torment, especially in the presentation of dialogue and characters, and the amount of prose we crafted for the game (over 1.2 million words!). MS: One of the things I think made Planescape: Torment so compelling was the minimal focus on combat, and the way that so many encounters could be resolved through dialogue instead. 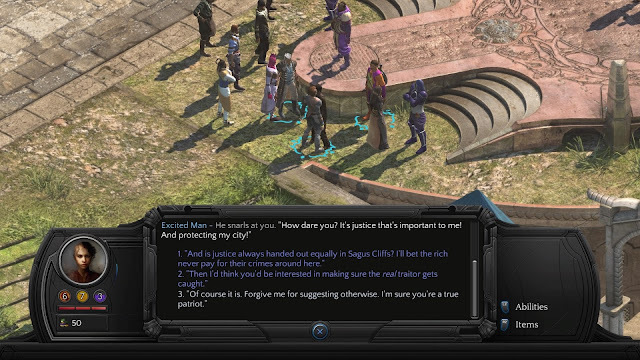 Is this something that we can expect from Torment: Tides of Numenera, too? AH: Very much so. We took it even further, making "no filler combat" one of our design conventions. The result are several hand-crafted scenarios where combat is rarely the only solution. The player can sometimes talk to enemies or use elements of the environment to their advantage. And combat scenarios are tied tightly to the narrative, so how the player chooses to resolve a situation can have consequences to the story. Finally, even though we hand-crafted every combat scenario, nearly all of them can be skipped entirely by making certain choices or saying the right thing. Rather than being forced to fight, combat is just one of many options available to the player to achieve their goals. MS: The fluid approach to alignment was fascinating, too, with players starting out neutral and then slowly shifting towards good/evil, law/chaos based on their actual actions in-game, and people responding to them differently depending on that alignment. This made moral decisions so core to the game's experience. 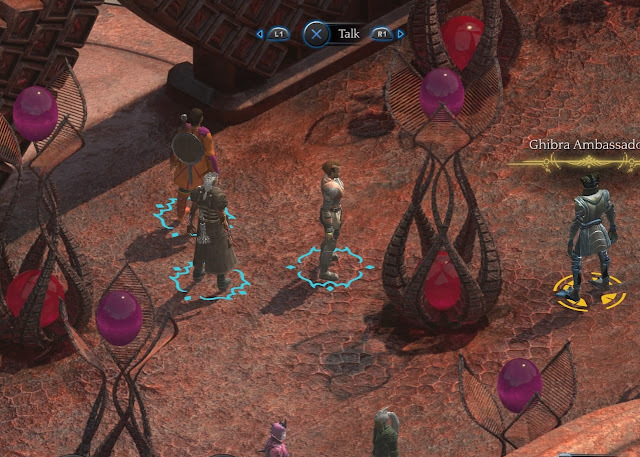 Are you exploring similar ideas in Torment: Tides of Numenera as well? AH: Absolutely. There are a couple of facets to this. First, our alignment system (called The Tides) works very similarly to how it did in Planescape: Torment. The player begins as neutral in the Tides (an "idealist"), and their choices of what to say and do throughout the game increase one or more of the five Tides. 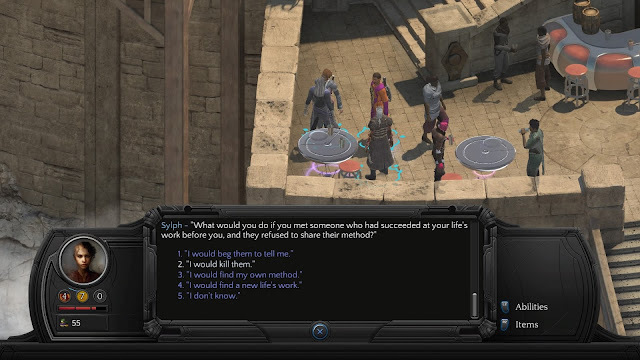 Unlike Planescape: Torment, the five Tides are orthogonal to each other—the player can focus on one, two, or even all five Tides at once. The game tracks your most dominant Tides, and several conversations respond accordingly. Some NPCs are more easily persuaded by someone dominant in a certain Tide, while others might be more difficult to deal with, and there are rare NPCs who can detect your Tides and might try to use them to persuade you. The result is a more nuanced alignment system that responds better to the player's play style. Another facet is about moral decisions. None of the Tides are inherently "good" or "evil"—another way Torment: Tides of Numenera differs from Planescape: Torment—so the game does not track the morality of the player's decisions directly. Instead, each decision has its own natural consequences. If you kill someone for betraying you, they won't be around later—and their former boss may or may not like the fact that you took them out. If you convince a crazed cultist to close a portal to Hell, it has effects on the area previously afflicted by demons—maybe good, but not always. This lack of morality-tracking allows us to explore more shades of gray. Quests don't have a good solution and an evil solution. In fact, one of our design conventions was that there should rarely, if ever, be an obvious "best solution" to the game's problems. The player should be making their own choices, not trying to divine what the designer thought was the right solution. So there are several situations where the morality of your choice isn't clear—there are downsides to all options, and you have to choose what is most important to you. MS: You've kept that isometric top-down perspective. What do you think it is about that omnipresent viewpoint that works so well for RPGs, because it does remain relevant to the genre to this day? AH: A lot of what ties RPGs to a top-down perspective is their roots in tabletop. Paper RPGs have always been top-down (when they are represented visually at all), and their computer counterparts have frequently tried to emulate that, from Neverwinter Nights to Baldur's Gate all the way back to Pool of Radiance. It shows the player at a glance where they are in relation to everything else, setting the scene in the way a pen-and-paper GM might. When you walk into a tavern, you immediately see the thing as a whole—in the same way a GM might describe it to you verbally—letting you get on with the business of interacting with people and solving quests. Top-down also allows for more tactical combat (esp. with a party) than first-person generally does. MS: Do you think it's more risky to create a game in the vision of a genuine classic, so well regarded as Planescape: Torment is? Did the team ever feel the weight of expectation through development? AH: Every. Single. Day. The entire team was constantly aware of the burden we had placed on ourselves. From the beginning, we stated that we were not trying to make something better than Planescape: Torment, rather a game that could stand alongside it, but even with that qualifier the pressure was immense. Fortunately, we have several Planescape veterans on board, as well as others who are passionate and intelligent fans. So it was a huge challenge (one we never took lightly), but our team is more than prepared to meet it. MS: Why move Torment: Tides of Numenera's setting away from Sigil and the Planescape setting, when Sigil was such an integral part of the original Planescape setting? AH: The first thing we did—back near the end of 2012—was we reached out to see if we could get the Planescape IP for our game. When it looked like that wouldn't happen, we began asking ourselves what would make a setting truly Torment. It had to be weird and wonderful, on par with the planes, with plenty of opportunity for deep, philosophical questions. Colin and I were cooking up something of our own when Colin suggested Monte Cook's Numenera RPG. I admit, at first I was wary that Numenera would be too much sci-fi for a Torment game, but the more I thought about it, the more it grew on me. A city of doors like Sigil would fit naturally into Numenera, as would Morte or the Dustmen or even cranium rats. Now, we didn't use any of that—we made up our own locations, factions, and creatures, rather than ape the successes of Planescape—but the fact that we could implement all those things, without stretching the setting beyond belief, was what sold me on it. Now, I can't imagine doing Torment any other way. MS: Mortality was a key theme in Planescape: Torment, and based on what I've read of Torment: Tides of Numenera so far, it seems to be the same case here. Are there any other narrative themes that you'll be exploring through the game? AH: The main themes we hit throughout the game are legacy, abandonment, and mystery. Legacy is the core idea behind the game's question "What does one life matter?" and it speaks to mortality: in the face of inevitable death, what impact do your life's choices have on the world and those around you? Do they matter at all? This theme is explored throughout the game. The other two are secondary themes, but no less important. The player character, as well as the PC's so-called siblings, have literally been cast aside by their creator. Each one of them deals with their situation differently, and it's ultimately up to the player how they will choose to deal with this abandonment. At the same time, the Ninth World—the setting of Numenera—places human civilization amongst the detritus of great and powerful civilizations who rose to power and then disappeared. The world itself has been, in many ways and at many times throughout its history, abandoned by those who once cared for it. As the player travels through this world, they will feel this abandonment keenly as well. Finally, the theme of mystery is a core theme of the setting itself. The civilizations that came before had access to mind-bending technology that may as well be magic—both to the Ninth Worlders and even to us. How does this sphere float in the air like that? What was it for? What can I do with it now? These questions pervade everything the player comes across. MS: Do you see potential for future "Torment" games? BF: Anything is possible; it would have to be the right concept and the right team to consider it. MS: Finally, what games do you like to play yourself? BF: I try to put an hour or two into a number of games so I can understand what makes games compelling across the board. I finished Inside recently, put quite a few hours into Shogun: Total War and have played most of the top 20 games in VR. My learning never stops. AH: I play a lot of different genres (though most especially adventure games), but lately I've been falling in love with indie games that aren't so easily categorised. Some of these are doing really great things with systemic gameplay, like Party Hard and the upcoming Wildfire. Others, like Inside and Abzu, are showing that games can move people emotionally and tell powerful stories without any words at all—that games are well and truly art. It's these sorts of innovations that I love to discover and support.